Institute of Technology Carlow played host last week to the regional final of the Student Enterprise Awards where students from ten secondary schools around Carlow presented their businesses in the hopes of representing County Carlow at the Student Enterprise Programme National Finals in Croke Park on Friday, 3rd May. In the Junior Category of the competition, the student who will represent Carlow at the National Finals in Croke Park is solo entrepreneur Sam O’Broin from Gaelcholáiste Cheatharlach with his business, Irish Keys. 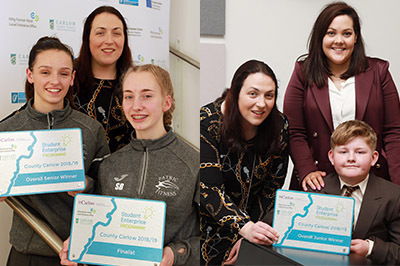 In the senior category, Presentation De La Salle Students, Niamh Bambrick & Sarah Baldwin will represent the county with their business, ‘SupportingHer’. The enterprise education initiative, funded by the Government of Ireland through Enterprise Ireland and delivered by the 31 Local Enterprise Offices in local authorities, is the most successful student enterprise programme of its kind in the country. An estimated 26,000 students from 490 schools around the country begin their entrepreneurial journey every year with the help of their teachers, student enterprise co-ordinators and Local Enterprise Office. Speaking at the county final, Pauline Hoctor, Senior Enterprise Development Officer of the Local Enterprise Office in Carlow County Council congratulated the students, saying “We have a very successful student enterprise programme here in Carlow with over 450 students from 10 local schools taking part this year. Our national finalists are excellent ambassadors for the programme and we wish them the very best of luck in Croke Park on 3rd May”. She continued: “What our students are learning from the programme is that with the right supports and encouragement, they can take an idea from the classroom and develop it into a real-life business. The skills they learn along the way, such as business planning, market research, selling and team-work, will help them become more entrepreneurial throughout their future careers”. Holohan went on to say “awards are an important way for us to showcase the talent and achievements of entrepreneurs in the County and we believe that by running the Student Enterprise Programme we are supporting the next generation of entrepreneurs who will create jobs in our rural communities in the future”. Other schools competing at the Institute on the day were; St Leo’s College Carlow; St Marys Academy Carlow; Presentation College Carlow; Tyndall College Carlow; St Mary’s Knockbeg College Carlow; Tullow Community College; Coláiste Eoin Hackettstown; Borris Vocational School. For further information about the Student Enterprise Programme, visit www.studententerprise.ie or search #studententerprise on social media.